Finish: Balanced acid and sugar lead to longer than expected finish, with sugar/acid balance that leaves the mouth watering. A great food pairing wine. Fermentation: Stabulation occured on the juice for 2 weeks at 31° F. Stainless steel fermented at temperatures averaging 53° F.
A rather average winter in 2018 gave way to summer that, although not record in temperatures, was unique in the consistency of the warm days through June and July. By mid-summer, the region had already accumulated Growing Degree Days in excess of warm vintages such as 2016. Mother nature took a turn for August through September, with punishing levels of rain and humidity, that when combined with the warmth, created an incredible amount of inconsistency in fruit quality across the vineyards of the region. Working with select small growers, and bringing a new Keuka Lake vineyard into Bellangelo’s production, we saw no deterioration of quality in the fruit we harvested. With that said, the vineyards required an enormous amount of extra work and diligence, as well as proactively dropping any fruit of inferior quality. In all, the 2018 vintage can be described as a classic challenging Finger Lakes vintage, where extra labor in the vineyard still produced some beautiful cool climate wines. 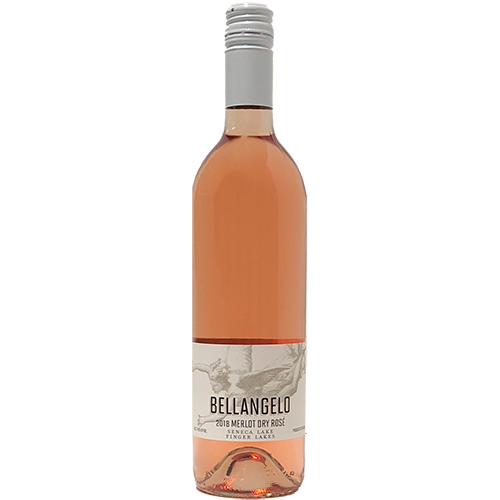 The price of this product varies with the quantity of products ordered in the category "Rosés"